Flag and Universities Day is observed in Haiti on May 18 every year. This holiday celebrates educational system as well as the creation of the flag of Haiti in 1803. The flag of Haiti consists of two horizontal blue and red bands, which are defaced by a white panel bearing the coat of arms. The coat of arms depicts the weapons ready to defend freedom and royal palm for independence. A white scroll on the coat of arms reads L'Union Fait La Force, that means Unity Makes Strength. The first flag was adopted on May 18, 1803 at the Arcahaie Congress on base of the French tricolor. The white band was ripped out, the reminding bands were sewn together. 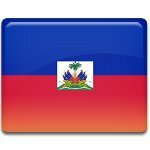 It's said, that red color of the flag symbolizes the Gens de couleur (French for “people of color”) and blue represented Haiti's black citizens. This story is widely known in Haiti and people celebrated Flag Day. In 1919 the government proposed to expand the holiday and renamed it into Flag and Universities Day. The decision was made due to the threat of the inviolability of the educational system, caused by American occupation that began in 1915.